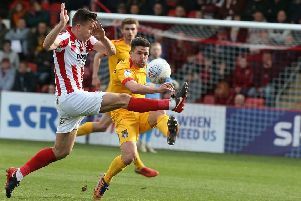 Cheltenham Town manager Michael Duff felt his side were the ‘physically dominant’ team and found ‘different ways’ to hurt the Cobblers during their 3-1 win at Whaddon Road on Saturday. The Robins continued their strong home form as Luke Varney’s first-half brace set them on their way to a fifth win in six games at Whaddon Road before Tyrone Barnett killed off the contest when heading in a 73rd minute third goal. I was disappointed with the goal because I thought we deserved a clean sheet. I don’t think they hurt us enough to score a goal. 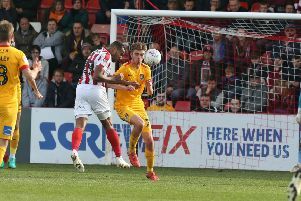 Town scored a consolation through Dean Bowditch’s free-kick a minute from full-time – something which irritated Duff – but Cheltenahm were undoubtedly worthy winners as they ended their visitors’ eight-match unbeaten run, securing a second 3-1 win over Northampton this season. “It was a good performance,” said Duff, whose side remain 17th in League Two, four points below the Cobblers. “We moved the ball well and were physically dominant I thought. “I was disappointed with their goal because I thought we deserved a clean sheet. I don’t think they hurt us enough to score a goal, but I’m really happy with the overall performance. “Northampton are a tough team. They were unbeaten in eight and have conceded four goals in their last eight games. “We scored three against them and their goalkeeper has made three or four great saves and a couple of one-on-ones, so the thing I was most pleased with is that I thought we hurt them in different ways. “We moved the ball well, but we went long as well. I don’t want to play one style - we went through a stage where we went to Crawley away and it was 600 or 700 passes but we never really hurt them.